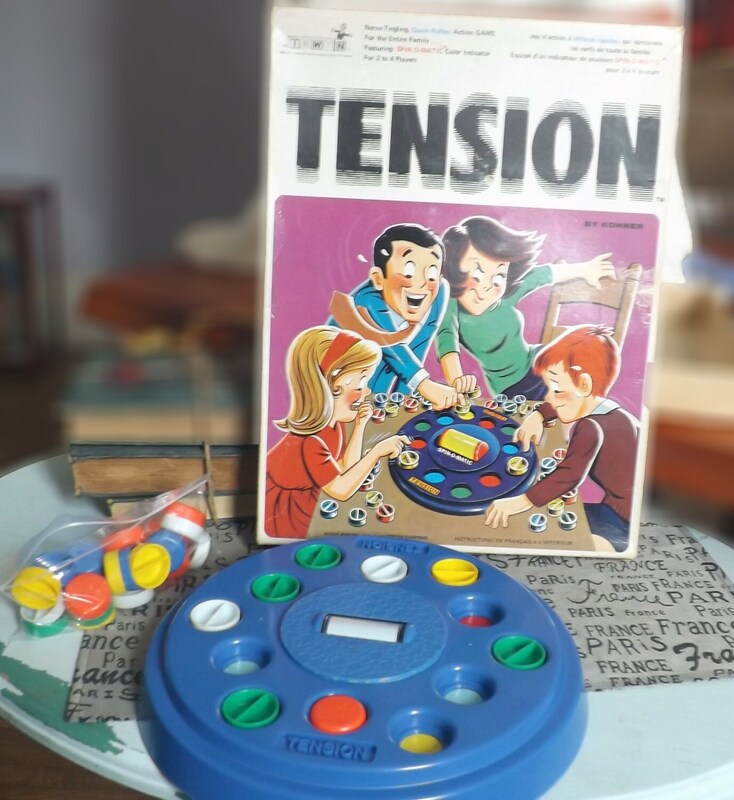 Vintage (1970) Tension board game published in Canada by Kohner and Irwin Toys. Bilingual (English | French Canadian) packaging. 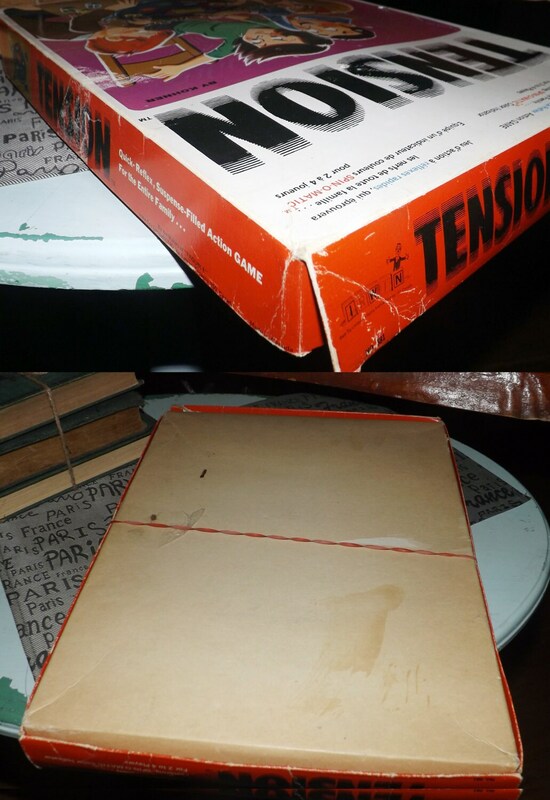 Vintage (1970) first-issue Tension board game published in Canada by Kohner | Gabriel | Irwin Toys. Bilingual (English | French Canadian) packaging. THIS GAME HAS BEEN INVENTORIED AND IS INCOMPLETE missing 1 red player disc and 2 yellow player discs. Game includes a reproduced copy of the instructions. In the US issue of the game, the instructions were printed on the back of the game box. NOTE: In the Canadian version, because of the requirement for bilingual (English and French Canadian) language text, the instructions were originally printed on a separate sheet that was inside the game. We have included a print-out of the original English instructions from the back of the US game box. Great family game from the start of the Groovy (like me!) '70s from the maker's of the classic board game Trouble, this time featuring the hyped spin-o-matic color wheel. - 4 Dark Blue cover disks (used only when the game is played with 3 players). 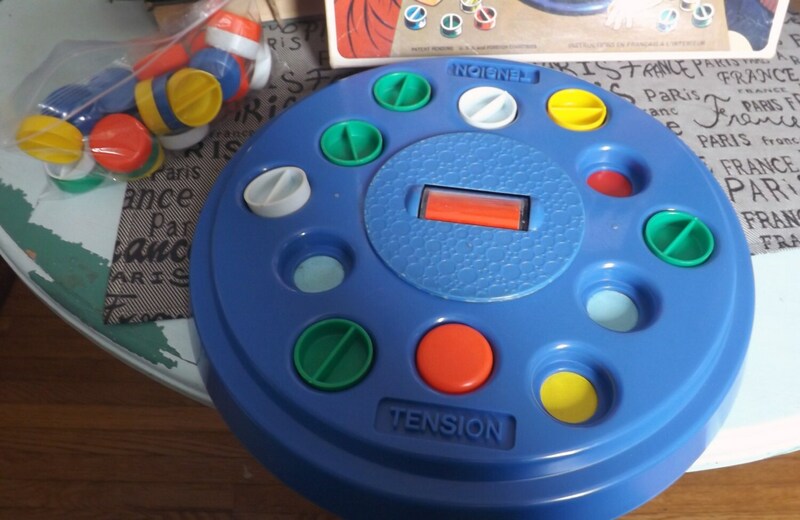 Game play: Marketed as "Tension, the nerve-tingling, quick-reflex action game for the entire family". The game features a SPIN-0-MATIC color spinner that only shows one color at a time. 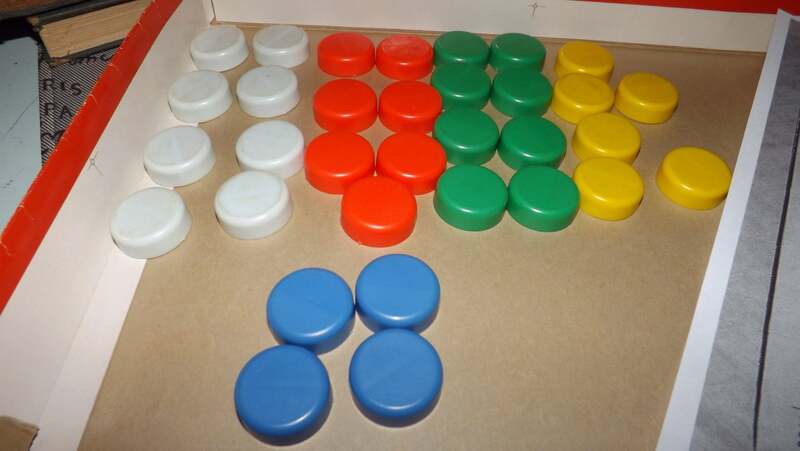 When it stops, players rush to place their disks into wells on the board that match the color on the spinner. The first player to get rid of all their color disks wins the game. This game is in very good condition and almost complete, missing only 3 of the plastic discs. The Spin-o-matic color wheel works properly and spins easily and as it should. The game box is in FAIR condition with a broken corner and tape residue on the box top sides and base (see photo 5 specifically), but nonetheless, the box holds together well. The game box shows moderate shelf wear, with MODERATE! fading of the box graphics but all text and images fully legible and viewable. MULTIPLE PURCHASES AT THE SAME TIME? Use the Combined Purchase Discount coupon at check-out! 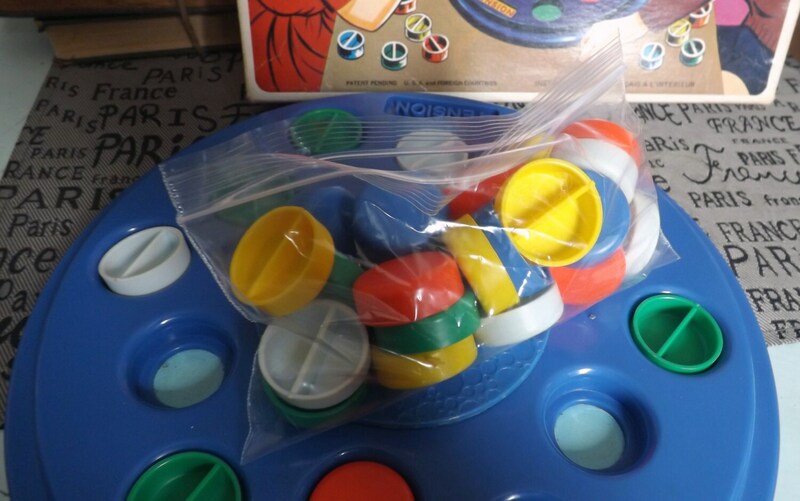 Coupon code COMBINEDITEMDISCOUNT saves you 20% on your entire order from BuyfromGroovy when buying more than one item at the same time from the shop.NOTE: The Vintage Board Game and Jigsaw Puzzle sale policy applies to this item. Read the details of this policy in the Shop Policies section of the store.